Basically slapping "Force" at the end of a team name, just for Rule of Cool. Probably because certain Real Life organizations used "force" in their names, so you want your team to seem just as strong. To fit this trope, "Force" has to be at the end of the team name, and it has to be a team explicitly calling themselves that just to seem cool. Not to be confused with the forces of physics. Compare Awesome Mc Coolname, NameTron. The English adaptations of Dragon Ball Z translate the Ginyu Special Squadron as the Ginyu Force. Lyrical Nanoha's Riot Force 6. On a side note, this seems to be an Ascended Meme fansubbers in this case. The Japanese name for Hayate's unit is "Kidou Rokka", which basically translates to "6th mobile division"; hence, the less popular "Mobile Section 6" is actually a more accurate interpretation. In America, Science Ninja Team Gatchaman is known simply as G-Force in its macekre version Battle of the Planets as well as the second adaptation named G-Force. In Star Blazers, the English dub of Space Battleship Yamato, the ship's crew are called the Star Force. Miniforce, an animal hero team reminiscent of Tokusatsu action shows like Super Sentai / Power Rangers. Fantastic Force — A Fantastic Four spinoff team. X-Force — The X-Men's strike team. 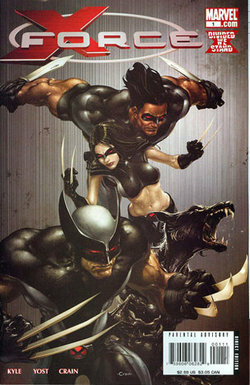 At one point in the early 2010s, there were two incarnations of X-Force active at the same time; they crossed over shortly before being cancelled/merged. A-Force, an all-female Avengers team established as part of the Secret Wars event. Freedom Force, a government-sponsored superhero team made up mostly of the "reformed" Brotherhood of Evil Mutants and led by Mystique. Night Force — Supernatural investigators. Atari Force — Originally a team of cross-dimensional explorers from a Crapsack Future. After Battle Comics lost the right to publish Action Force (see below under Toys), they came up with a thinly veiled ripoff called Storm Force. Fox Force Five, an In-Universe example from Pulp Fiction. Mega Force, aka the film with the flying motorcycle. Tribulation Force and Millennium Force from Left Behind. Phoenix Force from The Executioner. A syndicated action series Super Force. Power Rangers Time Force, Power Rangers Wild Force, Power Rangers Mystic Force and Power Rangers Megaforce. Power Rangers: Beast Morphers also has the Rangers as part of the organization Grid Battleforce. The Korean versions, which use the Power Rangers name but have been straight dubs of the Super Sentai source material for some time, take this and run with it, including "Magic Force" (Magiranger), "Treasure Force" (Boukenger), "Engine Force" (Go-onger), "Jungle Force" (Gaoranger), "Miracle Force" (Goseiger), "Captain Force" (Gokaiger), "Dino Force" (Kyoryuger), "Animal Force" (Zyuohger), and "Galaxy Force" (Kyuranger). Though Shinkenger has not been aired in South Korea, it is known as "Samurai Force" in the Korean dub of Kamen Rider Decade and "Blade Force" in Captain Force/Gokaiger. The only Korean titles to avert a "force" name since the practice began were "Power Rangers Dino Thunder" (Abaranger), "Power Rangers S.P.D." (Dekaranger), "Power Rangers Wild Spirits" (Gekiranger), and "Power Rangers Go-Busters" (... Go-Busters). Five Iron Frenzy's song "Abraham Lincoln Beard" has the line "NINJA FORCE FIVE THOUSAND". 80's US Power Metal band Titan Force . Special Force, a commando squad. Tito Santana and Rick Martel teamed in WWE as Strike Force. Action Force, the original European branding of G.I. Joe. Assorted parts of the Transformers mythos give us Noble Force Mini-Con Team, Maximal Command Security Force, Rescue Force, Rotor Force, Galaxy Force, and Super-God Masterforce, among others. Star Com toys were marketed as "The U.S. Space Force''. The Animated Adaptation, on the other hand, treated the team as multinational. Green's Seven Force in Gunstar Heroes, which can split to seven different entities: Soldier Force, Tails Force, Tiger Force, Eagle Force, Blaster Force, Urchin Force and Crab Force. Gotcha Force, which has a second shot at it with the villainous Death Force. GLaDOS: To boost morale, I think we need a code name for the...elite squadron we have here. We should name it after your specialty. I know: Special Team Falling Into Acid Force. The PlayStation game Fighting Force. Skylanders: Swap Force, named for a subset of the heroes that can "swap" LEGO Body Parts. Broforce. The titular team is made of parodies of (mainly) 80's/90's movie action heroes. An April Fools' Day gag crosses this, Darker and Edgier, and Xtreme Kool Letterz as it turns the Homestar Runner cast into the "Xeriouxly Forxe". A very literal example, as "Rule of Cool" is the only justification for their being called any kind of "force". When the Army Air Corps split off from the US Army, it was renamed to the Air Force, after the Royal Air Force of Britain. While we're on the subject of air forces, how about the Royal Canadian Air Force, eh? Which was replaced in the 70's by Canadian Forces Air Command, combing Trope Force with that cool effect you get where a military unit has "Command" in its name. The original name returned in 2011. Many armed units such as the Delta Force, though that is not the unit's official name. Special police units will sometimes have names such as "Rapid Reaction Force" or something like that. Pre-1961, the French nuclear arsenal was known as the "Force de Frappe ", which means, roughly, "Striking Force"
In 1961, they renamed it to "Force de Dissuasion", or "Deterrent Force"